French President Francois Hollande criticized Israeli Prime Minister Binyamin Netanyahu for being "obsessed with Iran" and for turning a recent memorial service, for four Toulouse Jews killed by an Islamic terrorist, as an "election rally." "Netanyahu came to France to campaign and we knew that," Hollande told journalists in private remarks which were later leaked by the French weekly Le Canard Enchaine. Last Thursday, the two leaders attended a highly emotional service for a rabbi and three Jewish schoolchildren who were shot dead by Al-Qaeda inspired killer Mohamed Merah on March 19 outside of a Jewish school in Toulouse. 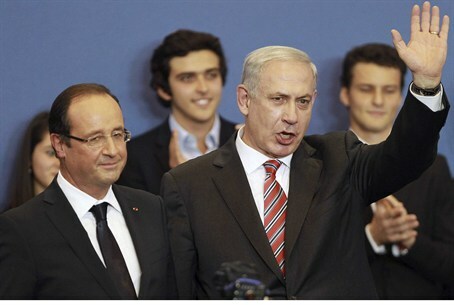 Hollande said the Israeli prime minister transformed the event into an election rally. "We knew Netanyahu was coming to France as part of his election campaign," Hollande was quoted by Le Canard Enchaine as telling reporters. "The event in Toulouse was supposed to have two parts – a memorial ceremony, and then speeches. Because I was there, he softened his speech a little, but it was inappropriate to turn the ceremony into an election rally." Netanyahu had compared the gunman to Nazis and warned that Israel could defend its people from those "who want to erase us from the map," and summed up his speech with a call for the Jews of France to come home to Israel, ending with a lively chant of "Am Yisrael Chai" (Israel will Live!). “Anyone who does not respect the human rights of Jews will not respect the human rights of other people,” said Netanyahu. “In the dark days of Nazism most European governments did not lift a finger against the madness of anti-Semitism. But today I am here with my friend Francois Hollande, who speaks clearly and resolutely against this folly, and fights against it," he said. According to weekly, Hollande also told reporters that Netanyahu was "obsessed with Iran", and said that it was all he and the Israeli leaders spoke about during their lunch meeting.